Kalamazoo, MI: On February 1st, investigators from the Kalamazoo Valley Enforcement Team and officers from the Kalamazoo Metro SWAT Team executed a search warrant in the 600 block of Florence St. This warrant was in reference to countless citizen complaints of drug dealing and firearm related violence in the area. During this incident, officers located two suspects standing in front of the residence. Both suspects attempted to flee the scene on foot but were quickly apprehended. 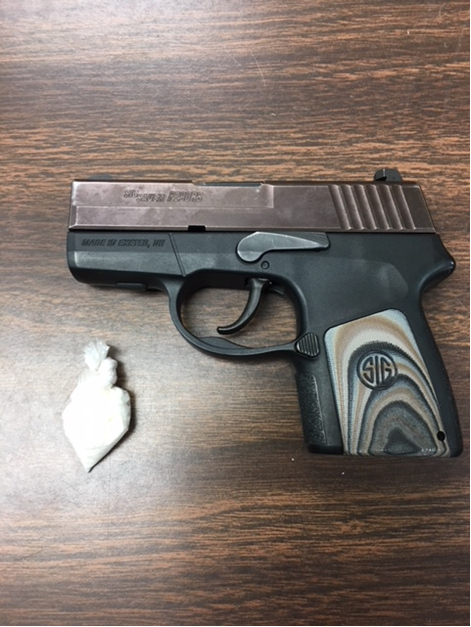 One of the suspects was observed throwing a loaded firearm and was found to be in possession of a dealer amount of Crack Cocaine. The firearm was recovered and found to have been recently stolen from a house in the County of Kalamazoo. Upon entering the residence, officers located four additional suspects inside. 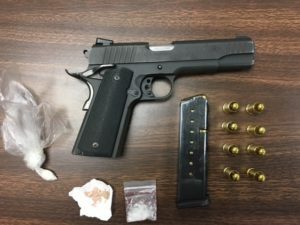 A 24 year old Kalamazoo man was arrested on two outstanding arrest warrants, Carrying a Concealed Weapon, Felon in Possession of a Firearm, Felony Firearms, Possession With Intent to Deliver Crack Cocaine, Resisting Arrest and Frequenting a Drug House. Three of the four suspects located inside were also arrested on outstanding warrants. Kalamazoo, MI: On March 29, 2017, Kalamazoo Department of Public Safety (KDPS) officers were dispatched to the 1700 block of N Church St regarding a domestic assault with a firearm. KDPS dispatch advised that the suspect used a handgun during the incident and fled the scene. Officers made contact with the victim to gather additional information and set up a perimeter for a K-9 track. Kalamazoo Public Safety officers observed the suspect walking back toward the initial scene and arrested him for domestic assault. Officers were not able to locate a firearm at that time. The residence was secured while officers applied for a search warrant. The search warrant was ultimately signed and executed. No one else was located inside the home. A search of the residence revealed a stolen .380 caliber handgun, matching the one used in the assault. Officers also located additional .380 caliber ammunition, crack cocaine, marijuana and US Currency. The suspect, a 29 year old Kalamazoo resident, was arrested and lodged at the Kalamazoo County Jail for Felony Domestic Assault. Officers are also submitting charges for drug and weapons violations. Kalamazoo Public Safety officers are still investigating leads and other potential suspects in the case. Anyone having information regarding this incident is asked to contact the Kalamazoo Department of Public Safety at 337-8994 or Silent Observer at 343-2100. Kalamazoo, MI: During the afternoon hours of February 10, 2017, Kalamazoo Department of Public Safety Officers was investigating a hand to hand drug sale witnessed by officers. The investigation led to the 100 block of E Clay where officers attempted contact with the residents. While at the house, officers gained probable cause to draft and execute a search warrant. On February 10, 2017 at approximately 1400 hours the signed search warrant was served. A total of four occupants were found inside the residence. Upon completion of the search warrant, multiple items of contraband were located. Suspected crack cocaine and packaging materials, marijuana, and a stolen firearm were recovered from the residence. Two females were arrested: The first is a 52 year old resident of Kalamazoo. She was arrested on drug possession charges. The second was a 32 year old resident of Kalamazoo. She was arrested on frequenting a drug house and multiple warrants. The investigation is still ongoing at this time. Kalamazoo, MI: On January 23rd, investigators from the Kalamazoo Valley Enforcement Team executed a search warrant in the 3300 block of W Main St in the Township of Kalamazoo. This warrant was in reference to an on-going investigation into the distribution of Heroin and Crack Cocaine from a suspect living in the area. Prior to executing the search warrant, the suspect was arrested outside of the residence. A search of his person revealed a large amount of Crack Cocaine, Powder Cocaine and over 8 grams of high quality Heroin, equal to approximately 80 user doses of heroin. 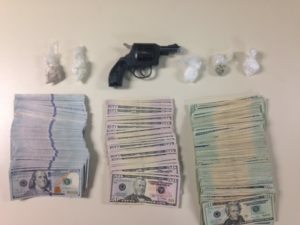 Upon searching the residence, investigators located additional Powder Cocaine, evidence of the manufacturing of Crack Cocaine, a loaded handgun and over $23,000.00 in US currency believed to be the proceeds of drug trafficking. A 26 year old Kalamazoo Township man was arrested for Possession With Intent to Distribute Heroin, Possession With Intent to Distribute Crack Cocaine, Possession With Intent to Distribute Cocaine, Felony Firearms, Felon in Possession of a Firearm and Maintaining a Drug House. The suspect was lodged at the Kalamazoo County Jail. This case will be forwarded to the Kalamazoo County Prosecutor’s Office for review. KVET investigators will continue to aggressively investigate heroin distribution in Kalamazoo County in order to combat this horrible drug.